The chain on a chain saw is connected to the motor by a centrifugal clutch, which is a spring-loaded device that engages only when the engine reaches a particular speed. Like the clutch in a standard-shift automobile, a chain saw clutch has a high-friction coating, and when the chain saw clutch's coating wears out, the clutch slips and the chain won't turn. The chain sprocket, which is part of the clutch, also wears out. Usually, both parts are replaced together. A chain saw loses power when the clutch slips. 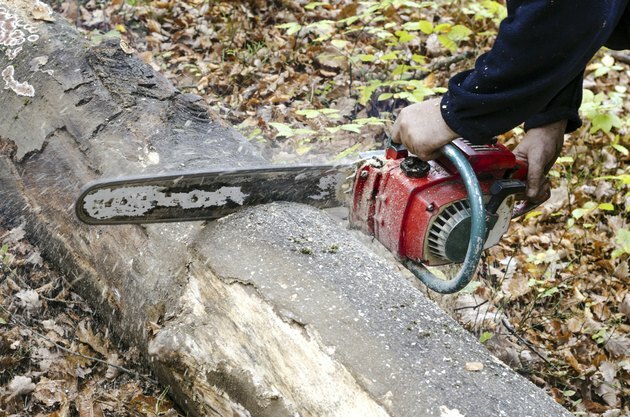 In order for your chain saw's clutch to engage, the motor must run at a minimum speed. If it doesn't run fast enough to engage the clutch, then clean the air filter and spark arrestor, and replace the spark plug; those are maintenance procedures that should be performed regularly. The carburetor also may need adjustment, especially if the motor stalls or runs sluggishly. The adjustment screws are usually near the air filter, and using a flat-head screwdriver is necessary to turn them. Consult your chain saw's manual, and use a tachometer when making the carburetor adjustment. If you performed all the required maintenance tasks and are sure the engine runs well but the chain still doesn't turn, it's time to inspect the sprocket. That procedure requires removing the chain; before you do that task, disable the saw by removing the spark plug wire. Then remove the clutch cover by loosening the nuts holding it with a socket wrench; on some saws, those nuts can be turned by hand. Once the cover is off, put on a pair of protective gloves, and pull the chain a few inches while you watch the sprocket. If the sprocket doesn't turn, it's worn out. If the sprocket turns, then the clutch is worn. In order for you to access the clutch and sprocket, the chain has to be removed; wear gloves to protect your hands. Before unscrewing the clutch housing, stop the engine from turning, or else you won't be able to loosen the clutch screw. Stop the engine from turning by first unscrewing and removing the spark plug, and then screwing in a piston stop, which is a metal cylinder that prevents the piston from moving. Depending on your saw model, then use either a socket wrench or a special clutch wrench to unscrew the clutch. The clutch usually has reverse threads, which means the clutch must be turned clockwise to unscrew. After you've removed the clutch housing, you have access to the sprocket, which sometimes is part of the clutch housing. Even if the sprocket is separate from the clutch housing, it's a good idea to replace both the sprocket and the clutch housing, because when one is worn, the other usually isn't far behind. Also replace the clutch shoes, which are probably worn as well. If you didn't have to remove the clutch shoes to get the housing and sprocket off, then remove them now. It's a good idea to obtain a copy of the chain saw's manual so you'll have a point of reference in case you have difficulty removing the clutch shoes or reassembling the clutch and sprocket.